There may be times when you need to locate a copy of a set of LEGO instructions. Reasons vary – your existing ones may be damaged or lost; you want to recreate a set from your childhood; or you wish to build a set from parts. From where you source these instructions is dependent on whether you are happy to read a PDF or prefer to read the instructions in the original paper format. If you prefer to use the original paper instructions, your best bet is to purchase a copy via an online marketplace like Bricklink or Brick Owl. You can find both recent and vintage instructions for most themes. There is also a chance someone in your local LUG or Buy/Sell/Swap/Trade group on Facebook may have a copy they can sell or give to you. Not everyone keeps the instructions and many people are happy to see them go to a good home rather than the recycling bin. PDF copies of instructions may be acquired from a number of different sites. It’s worthwhile bookmarking a couple of the different sites because they don’t always have everything and, sometimes, the files may not work on one page but do on another. Brickinstructions.com – has a reasonable selection of sets going back to the mid-1960s but is not comprehensive. More recent sets have a downloadable PDF available but older sets are represented by scans of the instructions. letsbuilditagain.com – mostly concentrates on instructions from popular themes of the last 20 years but does have some older instructions. Well presented and includes a gallery to original creations made by kids. The Brickfactory – an older site that also includes catalogs, posters and stickers amongst their scans. It has a more comprehensive range of older sets but the site can be a little slow to load. swooshable.com – still in its BETA stage but it will search all of the popular sites for the availability of instructions. Will save you the effort of visiting each of the above sites individually. It can be hard to decide what to build next when you have run out of ideas. Many years ago, LEGO used to provide alternative builds on the back of the instructions or the LEGO set box. Themes like the Creator series can provide alternate builds but, for the most part, you need to rely on your own imagination. Luckily, there is a fantastic site called Rebrickable where you can enter the details of the sets you already have and it will provide you with instructions for other sets and original creations you can build with the same LEGO bricks. It will also give you a compatibility measure so you know how many extra bricks you need to obtain before you can build the item. Here are the details of the LEGO themed magazines that are currently available. The LEGO Club magazine is an official publication produced by the LEGO Group. There are multiple variants of this magazine available around the world. There are regional versions as well as versions for girls and younger children. In most countries, it can be ordered via the website at no cost. For those in the Australia and New Zealand there is an initial cost of $19.95 AUD, which covers you for all future issues – so long as you remember to renew it when required. Subscription forms can often be found in toy departments of major retailers, in toy stores or from the special LEGO Club Australia website. You can also subscribe via the isubscribe magazine subscription service. LEGO Australia regularly provides free subscriptions at special promotional events or as competition prizes. The main magazine is published quarterly. There is also a range of magazines available in digital format via the LEGO website. Brick Journal was the first major independent LEGO fan magazine. It started as a digital only publication in 2005 and became available in both print and digital formats in 2007. Editor, Joe Meno, describes it as “ ultimate resource for LEGO enthusiasts of all ages. It spotlights all aspects of the LEGO Community, showcasing events, people, and models in every issue, with contributions and how-to articles by top builders worldwide, new product intros, and more”. The magazine now has an Italian version and there are plans for expansion into other markets in the near future. Brick Journal is available bi-monthly. Blocks magazine first appeared in late 2014 and quickly gained a popular following amongst LEGO fans and the wider community. This is in part due to its availability in local newsagents as well as via a subscription. It can be purchased either as a print or digital subscription. It describes itself as “as celebration of everything LEGO. Aimed at enthusiasts young and old it is the perfect way to immerse yourself in the world of plastic bricks”. Blocks magazine is published monthly. Bricks and it’s sister publication, Bricks Culture, are the newest of the LEGO themed publications. Bricks enables one to “Immerse yourself in the world of LEGO fandom” and Bricks Culture focuses on “Recognising and celebrating the culture of LEGO and its place in the world”. Both magazines cover sets, themes, building, events and people. Bricks concentrates more on LEGO news with a strong focus on collecting and building whereas Bricks Culture is “artier” with a stronger focus on people and their stories. Bricks will be published monthly from August 2015 and Bricks Culture will be available quarterly. Print and digital subscriptions are available from their website. Starting in 2008, HispaBrick magazine was originally established as a means of sharing and retaining the works of Spanish AFOLs. The publication was originally available only in Spanish but, due to interest from other countries, the magazine became available in both English and Spanish from issue 3. It covers all aspects of the LEGO hobby including reviews, AFOLs, clubs, LEGO employees, events, and special uses of LEGO Bricks. There is a special emphasis on Mindstorms and Technic. HispaBrick magazine is published every four months and is available as a free digital download from their website. RailBricks is a specialist magazine that caters for the LEGO Train enthusiast. The magazine commenced in 2007 and is published irregularly. Although there hasn’t been an issue since mid-2014, there are plans to revitalise the magazine in the near future. Past issues are available as a free digital download or as a print edition from their website. Also available to a limited market of the UK and Ireland are magazines for kids on the themes of Ninjago, Chima and Friends. These began publication in 2014 and may feature a “free gift” with each issue. Recently, a Star Wars themed magazine with a “free gift” has become available in Europe. Declaration: this post only contains general information and does not include any specific information for any particular insurance companies. Experiences with insurance companies may vary from those listed below. At some point in time, you may wish to consider insuring your LEGO collection. Not everyone insures their collection and not everyone sees it as being necessary. If your LEGO collection is predominately used by children and only occupies a couple of large tubs, then it probably isn’t worth your time to have a separate insurance policy or a special provision within your regular policy. However, if you collection is predominately used by adults (AFOLs) or occupies a separate room, then it is probably worth considering insurance. Your choice of insurer and policy will be somewhat dependent on your financial situation and where you are located (country, region etc). Insurers that cater for specialist collections are more likely to have the appropriate structures in place to adequately value and insure your collection. Documenting and valuing your collection is one of the key features of ensuring adequate coverage in your policy. With something like LEGO bricks and sets, it is important to consider the replacement cost of your collection rather than the actual cost you paid. For example, if your collection contains something like a Café Corner or Market Street modular building, you would want to be able to replace them if they are damaged or stolen. Documentation requirements may vary from one company to another. Some may require photos and listings of your collections. Others may require receipts as proof of purchase. Likewise, valuation requirements may vary between companies. Some may be happy with your valuation (perhaps using a specialist site like Bricklink) or others may require an independent valuation. Finally, check the limitations of the proposed policy. Some have an upper claim limit on items and you may be required to have multiple listings in order to cover all of your collection. This is less likely to be the case if you have it listed as a special collection. This post was prepared with the assistance of members of the Queensland LEGO User Group (QLUG). For Australians, Legoland Malaysia (LLM) is the nearest LEGO theme park. For this reason, it is an affordable and accessible alternative to travelling to Europe or the US for one of the other parks. There are a number of alternative ways to get to the theme park. If travelling via Malaysia, you might like to catch the train from Kuala Lumpur (KL). This takes about 5 hours and is a great journey for train enthusiasts. If your time is more limited, you may like to consider travelling to LLM from Singapore. The journey only takes around 60-90 minutes and is fairly straightforward. Options include hiring a car (or going with a local who has a car), catching a coach bus or hiring a limousine or private taxi. Travelling by coach bus is one of the more popular ways to get to LLM from Singapore. WTS offer a combined entry and bus ticket. Their service operates from the base of the Singapore Flyer. You can either book in advance from home or when you arrive in Singapore. They do get busy, however, so it is worth booking in advance. Try to book a ticket for the earliest departure time in order to maximize your time at the park. You will need to be at the Flyer at least 30 mins before your departure. If you are early enough, they may put you on an earlier service. Check in with the ticket office, as they will need to give you your bus and entry tickets. On the return journey, speak to the WTS operator prior to boarding the bus to ensure you are on the right one. The disadvantage of this service is that you will need to leave the bus in order to pass through Immigration/Customs as you leave Singapore and as you enter Malaysia (same applies for the return journey). Make sure you note the bus number as you will need it for the Immigration forms and because the bus is moved between the time you get off and back on again and it is very easy to get confused. This is a lovely way to travel if you a travelling with family or a group of friends. For around $200 – $240 SGD you can travel with up to 6 people and you do not need to get out of the car at the Immigration point. There will also pick you up from and drop you back at your hotel. You will, however, need to purchase tickets for LLM once you arrive at the park. One recommended operator is sgmytaxi. Take local currency with you rather than trying to change it when you get there. Credit cards are fine to use. Remember to take your passport! Thanks to JL and AM from Western Australia for the notes on their recent experiences at LLM. LEGO are aware that people lose small LEGO bricks all the time. That’s why they give you extras of things like 1×1 plates and 1×1 tiles. Some sets use a lot of different colours of these types of bricks and you may end up with quite a few spare parts. This is normal. If you have extra pieces that are more like regular bricks or larger parts, then there is a chance that you may have made an error in the construction of your set. It’s not unheard of but it is really unusual for a set to contain a spare 1×6 brick (for example). Go back and have another look at the instructions. If there is a parts list at the back of the instruction booklet, see how many of that piece you are meant to have. If it is a spare, then congratulations! It doesn’t happen very often. The exception to this rule is with the 3 in 1 Creator sets where you may have leftover bricks from building any of the models as those bricks may only be used in one of the other alternate builds. 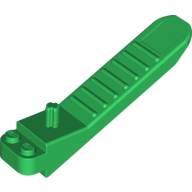 Some sets contain a Brick Separator. These are not meant to be part of a model and are designed as tools to help you separate LEGO bricks. They are meant to stop you using your teeth or fingernails. The picture shows the most recent design. These come in green or orange. The older version comes in dark grey or green. Despite the best efforts of those who are responsible for the manufacture of LEGO sets, there is sometimes an item missing or damaged in your set. It could be an individual LEGO piece; it could be the instructions or the sticker sheet. LEGO are aware this happens. That’s one of the reasons they include extras for the little pieces – they know the parts are easy to lose. They also have changed their packaging so the stickers and instructions are better protected whilst in the box. Things can still be damaged or missing, though, so LEGO has a service via their website from where you can order replacement parts. The pieces will be replaced free of charge but we recommend that you only use the service if you have a genuine missing or damaged part. Do not abuse the service. Some parts will not be available via the LEGO replacement parts service, even though they may be from a new set. If that is the case, you may have some luck purchasing what you need from either Bricklink or Brick Owl. It would also be worth trying members of your local LUG or a local LEGO buy/sell/swap/trade group on Facebook. You can also purchase individual or bulk parts directly from the LEGO online store – either from their Bricks and Pieces selection or via their online Pick a Brick site. Unless you have an account with LEGO, you are limited to how you can purchase a full, unopened box of collectables minifigs. Local Toy Store or Department store – If you are lucky and the store owner/manager knows you well, you may be able to purchase an unopened box from your local toy store. They may expect you to pay full retail for the box but it is becoming increasingly common for them to provide a discount for purchasing a full box. Bricklink – Until recently, this was the most common way to purchase a complete box. The initial price may be below regular retail but it will increase as each series goes out of production. Particularly useful if you don’t have a local independent toy store or LEGO retailer. Some of the early series are now worth a lot of money. Ebay – Much like Bricklink, the quicker you purchase the box, the better the price will be.